Copyright law protects a creative work from the moment it enters existence. This law guarantees certain rights and privileges to a person who creates a tangible work, such as an article, a song, or a photograph; it also limits others in how they can use someone else’s work. Copyright law is ambiguous. Some courts have charged infringement for the use of three sentences, two bars of music, even the phrase “put on a happy face.” Other courts have allowed excerpts of text or music. Churches must understand copyright law and commit to upholding it. 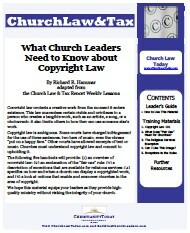 The following five handouts will provide: (1) an overview of copyright law; (2) an explanation of the “fair use” rule; (3) a description of exceptions that are available for religious services; (4) specifics on how and when a church can display a copyrighted work; and (5) a look at options that enable and empower churches in the area of copyright. We hope this material equips your leaders as they provide high-quality ministry without risking the integrity of your church. These laws affect churches at every turn. Here’s what you need to know about them. What Does “Fair Use” Mean for Churches? Don’t assume that “fair use” protects your church from copyright infringement. Churches can use copyrighted material in a service, but under these conditions. What you need to know about the lawful display of a copyrighted work. You can legally use copyrighted works if the use falls under these conditions. Develop a stronger understanding of copyright law with these resources.